After a $375 million investment in its engine plant in Redford, Mich., Daimler Trucks North America launched production of Freightliner models equipped with a new medium-duty diesel engine. The engine – the Detroit DD8 – is the second diesel engine built by the company for the vocational market. The smaller DD5 was designed mainly for the urban delivery market, according to the company. “The DD8 is built for performance with features that meet the needs of those specialized segments,” said Brian Daniels, manager of powertrain and component product marketing for Detroit, a subsidiary of Daimler, that develops powertrain components. The medium-duty market has been looking for more engine options, so Daimler having an alternative plays really well, Daniels said. The Daimler plant investment allowed the company to build both medium-duty engines at the upgraded facility. They join heavy-duty engines already in production. Until now the DD5 was built at Daimler’s factory in Mannheim, Germany. The DD8 engines are installed on the Freightliners at Daimler’s truck factory in Mount Holly, N.C. The trucks can also be outfitted with a medium-duty diesel engine from Cummins Inc. The DD8 is a 7.7 liter, six-cylinder medium-duty engine and is available on the Freightliner M2106, 108SD and 114SD models. The engine’s range includes 260 to 350 horsepower and between 660 and 1,050 pound-feet of torque. It is made for a variety of vocational truck uses such as pick-up and delivery, construction, refuse, as well as utility and maintenance. 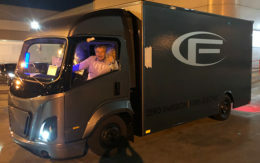 Daimler is the only manufacturer to offer customers a vocational truck that can fit either its in-house option – the DD8 – or a Cummins engine, said Kelly Gedert, director of product marketing for Freightliner and Detroit Components. “We built this from the ground up knowing that emissions regulations were going to be more stringent,” Gedert said. However, this is not the first time the DD8 engine has been used, she said. It’s been inproduction in Europe for nearly five years. The DD8 comes standard with Daimler’s Detroit Connect Virtual Technician, a remote diagnostics system meant to help fleets stay ahead of maintenance issues. The DD5 also will include the technology. 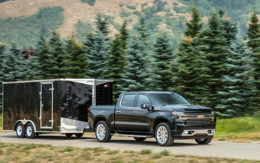 Maintenance intervals for vehicles equipped with the DD8 engines “are up to three times longer than the competition,” Daniels said, with oil changes and fuel filter replacements needed every 45,000 miles. Last year, Daimler’s market share in North America was 39.2 percent in the medium- and heavy-duty segments. “We are looking to grow in more of the medium-duty and vocational market with this particular engine platform versus heavy-duty,” Gedert said.